We spend a lot of time in our training developing our forms — doing kata helps us learn techniques and self-defense possibilities. 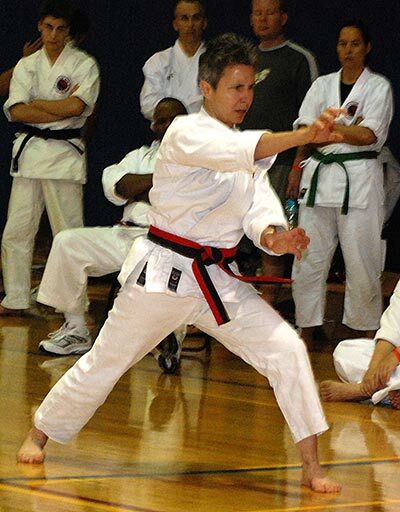 Praticing kata gives us the opportunity to learn how to demonstrate and express awareness, power and strength, softness, ferocity, and tranquility. We can imbue our forms with the properties of things like a mountain, a tiger, and a cloud. To develop a three-dimensional presentation of kata, the following three principles may be used for an optimal performance. Kata without an understanding of application is dance, and not nearly as profound an experience. As quickly as you learn a movement sequence, learn how to use those movements in self-defense, to trap and immobilize your partner. After you learn your application with one attack, try another attack and see what possibilities arise. You should have a minimum of three options per kata movement just to stay aware of the possibility of a movement as a defense, counterattack, or a combination of the two. Once you understand the application possibilities, then you should have an easier time refining the movement to reflect the power and potential of the movement. This concept is all about the mechanics of your movement. You should be grounded and use your body in the most relaxed, yet powerful and efficient way. You can learn how to have balance and be centered in the six directions of up and down, side to side, and front to back. Hit a stance and have a partner move around you contacting you in the six directions — push the back, pull the arm, press in on the sides to see if you can be off-balanced. Punch not with your arms, but with your legs. Your power comes from the earth, is generated by the legs, directed by the waist, and expressed by the limbs. A full body technique is far more powerful than a technique powered by the upper body. Practice your forms slowly, movement by movement, to test your balance and structure. Then practice your form with speed, and still test your balance and structure. Once you have learned your kata movements and understand how to apply the movements, it’s time to work on expression — your expression. You have your own personality and your forms should have personality as well. Do you want to appear strong and solid like a mountain? Light and airy like a bird? Fierce and powerful like a tiger? Practice your forms with a concept in mind — the concept you want the audience to think of when they see the form performed. Practice the same form with different concepts in mind just to expand your experience of the kata. Perform the form like you’re in water, like you’re soft and floaty like a cloud, like you’re expressing joy — the sky’s the limit. Our katas provide us a forum for learning movement, self-defense, and self-expression. Practicing the principles of understanding body mechanics and application and giving that movement energy and life, will enable us to present a richer and more dynamic form. Tell a story with your kata, and your audience will see that story unfold in your expression.